The government of technicians, presided over by the financier Monti, is about to fall because of the Party of the People of Liberty, and naturally, not for the widely canvassed one of “the good of the country”, behind which the interests of our bourgeoisie always hide, but on the basis of a narrow electoral calculation. Once again Berlusca demonstrates that he is the craftiest of the crafty. After supporting the Monti government, having voted for all its legislative proposals, he has therefore directly participated in the impoverishment of the proletariat, and a good part of the so-called middle class, as no government has ever done before. Now, with this move, he is trying to present himself as the only real opposition to this unpopular government. A phenomenon indeed! After voting in favour of all the social butchery provisions of the Monti government: from pensions’ reform to job cuts, from the tax rebate for the Holy Roman Church to the breathtaking increase in our taxes, to the elimination of any future job prospects for tens of thousands of those expelled from the workplace, from the spending review until the next Stability Law, no sooner was the technician’s task exhausted, that is the dirty job that nobody else wanted for obvious reasons was done, than Berlusca re-invents himself as champion of the dispossessed, and the only opposition to the government enslaved to the despotic troika (the ECB, IMF, EU). His demagogy has no limits! But why should we be astonished at the peculiar character of bourgeois politics and its petty political interpreters? As someone once said: we revolutionaries have to mercilessly fight demagogy, not only within proletarian ranks but between all classes, because the demagogues are the first enemies of the proletariat. Naturally we do not refer only to the vituperative Silvio, but to the whole parliamentary and parlamentarist spectrum, because many of them currently outside parliament would sell their mother in order to get in or win a seat, plus the salary that goes with it, and to put their hands on that sea of money that has always inundated those seats in parliament. As in fact can be seen in the attitude of the most democratic Bersani, who proudly declares that the PD will vote for the Stability Law, demonstrating its sense of responsibility here (to who? ), and attacking as well the PDL for its lack of responsibility and for having betrayed the inescapable issues facing the country. Abstract terms like “our native land”, “the interests of the country”, “responsibility”, and “people”, abound in the declarations of bourgeois politicians, as ample evidence of how they mystify and hide the truth with the aim of maintaining social cohesion and defending the status quo. But as usual, behind the verbal debates on TV and in newspapers, between those who they would like us to believe are real opponents, agreements and alliances in the common interest of their masters: the banks, the manufacturers and assorted entrepreneurs are made in secret. It was no accident that it was in the interest of all the parliamentary forces not to solve the problem of the electoral law, despite much bawling over the Porcellum, and to leave everything as it was. Returning to our Knight, we have to recognise that the political cleverness (obviously we mean in the bosses’ terms) of his manoeuvre of withdrawing support from the government: first, because as we said above, with this he enters the next election as the only real opponent of this government of sacrifices, cuts and taxes, with an attempt to win more votes from precisely those social layers hit by the Montian measures; second because it successfully sabotages reform of the electoral law so keeping the Porcellum, the true and personal creation of Berlusconi, even if it was put forward by a Northern League member. In short, the distrust of the government, once it had carried out its tasks as executioner of the proletariat, is the ace that Berlusconi has been able to pull down his sleeve in order to return to take part in the next election, in the hope of winning and so easing therefore his own judicial troubles. It remains to be seen how far the Italian ruling class is ready to entrust him with their own interests, knowing his character, more inclined to make laws in his own interests rather than that of his consenting “constituents”. For now, it seems that at least a part of the big bourgeoisie, has not appreciated the “return to the field” of Berlusconi, and the readiness of Monti not to submit to Berlusconi’s usual game of blackmail would seem to confirm it. In the end we should be happy with the fall of the government of the banks… but what waits for to us after the unanimous and devastating Law of Stability? Not more technicians but petty politicians in “democratic” guise, Christians or populists, but nevertheless always in the service of his Majesty, Capital. In short everything will change in order to remain the same until the proletariat enters the fray and, guided by its Party, blows away this perverse little theatre, its corrupt puppets and above all the puppeteers who hide behind them. Il Popolo della Libertá, founded by Silvio Berlusconi to replace his earlier electoral vehicle, Forza Italia (The football chant which means “Come on Italy”) Berlusconi is not only boss of Mediaset (making him the Murdoch of Italy) but also owns AC Milan. His announcement of once again standing for Prime Minister was made at their training ground. Berlusconi’s populism means he is ironically referred to in this account by his favoured nicknames of Berlusca and il Cavaliere (The Knight). The Stability Law is for three years and defines the framework for the state budget and the cuts in that period. The current one was adopted in November 2012. Ex-Communist and newly elected leader of the Democratic Party (PD) which currently leads in opinion polls (and is sought by almost all capitalist institutions as the man who will put through the Monti reforms with the least resistance from the working class). The Porcellum is the current Italian electoral law in operation since 2005. 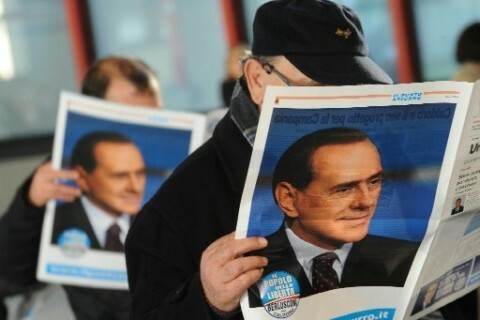 It was initiated by Calderoli of the Northern League when that party was in alliance with Berlusconi. It gives the party with the most votes a massive two thirds majority in parliament. For Berlusconi it was obviously a great way of dominating the Italian political scene even though not having majority support. Calderoli however later denounced has own idea as “una porcata” (crap) as it had heightened corruption and increased the cost of government. A famous Italian political journalist, Sartori then “latinised” his comment to call the electoral system the Porcellum (i.e. something for pigs). Which is why Berlusconi has held out an olive branch (or is it a poisoned chalice?) to Monti since this article was written.